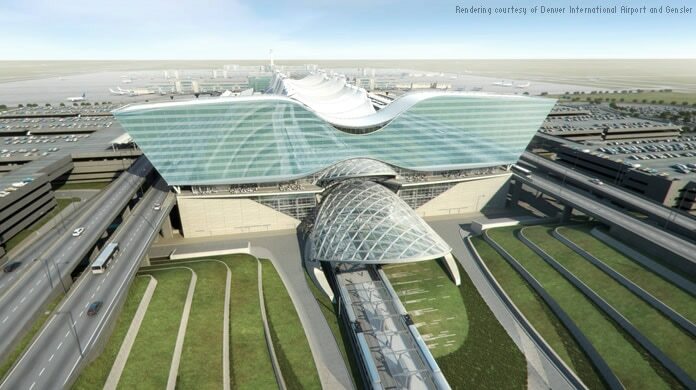 Denver's Hotel and Transit Center Program combines a commuter rail transit center and a 519-room hotel to create a new gateway to the Denver International Airport (DIA). The Building Information Modeling (BIM) process used for design and construction kicks off an even more ambitious airport-wide BIM conversion that will greatly improve ongoing facility management. This project is managed by HNTB and Parsons, designed by Gensler and under construction by MHS Tri-Venture (Mortenson, Hunt, Saunders) with enabling work provided by Kiewit. Airport projects pose unique challenges given the need for added security and the goal to minimize inconvenience to travelers. DIA's model-based approach accelerated construction with coordinated project timelines and collaboration around a central model. Integrated with the facilities management platform, the intelligent model will serve as the primary source of data for ongoing airport maintenance. More efficient maintenance in turn saves time and money, and improves quality. Because the detailed model will inform all ongoing actions, DIA can use it to scope potential projects. That reduces the need for time consuming and expensive feasibility studies—and adds up to big savings. Changes during construction can balloon into huge costs. BIM enabled cost savings in reduced work and fewer change orders by resolving clashes during design instead of construction.